The IMF & World Bank’s Spring meetings with finance ministers and central bankers, which took place in Washington DC recently, are one key forum where the IMF performs its mandated role as conduit of international economic co-ordination. The IMF uses its knowledge bank, expertise and mandate for economic surveillance and coordination to act as global arbiter of legitimate or ‘sound’ policy. This can shape the international economic policy debate, and how salient economic issues are understood. As such, the IMF’s interpretive framework for evaluating economic policy is a key site of power in world politics. Christine Lagarde set out the IMF’s policy priorities in a recent speech, warning of the dangers of rising protectionism. Eschewing the Fund’s customary under-statedness, Lagarde ominously stated that the multilateral trade order, that ‘system of rules and shared responsibility’ is today ‘in danger of being torn apart’. For the liberal oriented IMF to urge all to ‘redouble our efforts to reduce trade barriers and resolve disagreements without using exceptional measures’ is perhaps not surprising. However –other elements of the Fund prescriptive discourse clearly indicate significant evolution at the IMF since the maelstrom of the global financial crisis a decade ago. This, as Lagarde put it, is ‘not your grandmother’s IMF’. Key departures include concern that macroeconomic policy should reduce inequality, a more sceptical view of financial markets and their causal links to instability and systemic risk, and heightened appreciation of ‘non-linear’ threats such as deflation and stagnation. Gone, too, are the days of ‘one-size fits all’ policy recommendations. The post-crash Fund offers more differentiated policy advice, and betrays much less fiscal and intellectual conservatism than it used to. The Fund played a key role in characterising the nature of the economic policy problems generated by the 2008 crisis. Its crisis-defining economic ideas, and crisis legacy defining ideas, were important in constructing particular interpretations of the global financial and Eurozone crises. These prioritised particular policy responses – notably calling for more activist counter-cyclical policy. This, the IMF continues to underline, can be hugely significant in reducing the losses in output arising from recessions and economic crisis. They also advocate that economic policy should do more to tackle inequality. These evolutions unearth an important but under-explored linkage between Fund ideas, and ideational influence, and policy space enjoyed by governments. 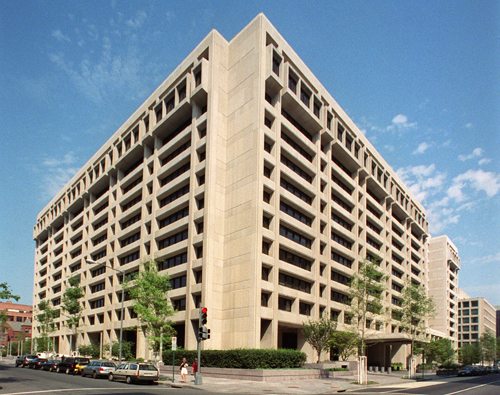 IMF Headquarters, Washington, DC. by International Monetary Fund. Public domain via Wikimedia Commons. The IMF’s somewhat surprising focus on inequality is justified as central to the Fund’s core mandate because IMF Research has unearthed a link between higher inequality and lower growth. The Fund urges governments to ensure that the burdens of adjustment and benefits of economic recovery are distributed equitably, to target spending, transfers and automatic stabilisers on lower earners. Repeated IMF advocacy of redistributive fiscal policy, and greater progressivity of income tax, contrasts starkly with the IMF’s traditional reputation for imposing harsh austerity measures. 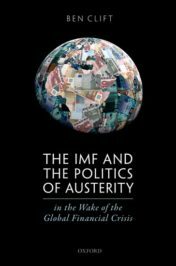 Analysing how the IMF contributes to prevailing understandings of sound or appropriate economic policy reveals the malleable, contingent, and changeable nature of economic orthodoxy. How prevailing views of ‘sound’ policy change is a deeply political process in which the Fund, for all the emphasis the institution places on the technocratic, scientific nature of its work, is intimately involved. To understand these shifts, it is important to grasp how the production of economic policy knowledge is a social process, and that there are a set of social norms within the IMF which need to be navigated by IMF staff and leadership seeking to advance or promote particular economic policy understandings or positions. The new ideas need to be reconciled to Fund standard operating procedures, and its sedimented economic policy knowledge. They must also be amenable to corroboration using the varied methodological techniques and other approaches favoured within the Fund. To achieve maximum longevity and increase their chance of shaping ‘how the Fund gets things done’, they need to be, as one insider put it, ‘baked into guidance’. That is, they need to be incorporated into technical notes circulated to Fund desks as a guide to their operational work. Yet once ideas gain acceptance internally, the real challenge comes when Fund leadership and surveillance missions seek to gain ‘traction’ for new IMF thinking with governments, and shift the wider economic policy debate. Whilst the IMF enjoys a privileged position in the construction of economic rectitude, it has little direct leverage over non-borrowing countries. For example, the Fund calls urgently for more muscular counter-cyclical regulation and larger financial firewalls: it seeks the creation of a ‘strong global financial safety net’ where ‘the IMF plays a central role in helping countries to better cope with capital flow volatility in times of distress.’ Yet the realisation of this ambition is unlikely: it requires greater resources than the Fund enjoys, and it requires buy-in from powerful member states, amongst others. Similarly, repeated IMF entreaties to make income tax more progressive and use more social transfers to reduce inequality may, in some cases, fall on deaf ears. Thus in this the IMF reforming reach exceeds its grasp. Featured image credit: 20120916 88 Mt. Washington Hotel, Bretton Woods, NH by David Wilson. CC-BY-2.0 via Flickr. Ben Clift is Professor of Political Economy in the Department of Politics and International Studies at the University or Warwick, UK. He is the author of The IMF and the Politics of Austerity in the Wake of the Global Financial Crisis. His wider research interests lie in comparative and international political economy, and he has published widely on the IMF, French and comparative capitalisms, the politics of economic ideas, the political economy of austerity and economic policy autonomy.